Ruthmere Campus is pleased to offer educational experiences for students preschool age through high school graduation. Click the program below that suits your needs. Through the generous sponsorship of the Community Foundation of Elkhart County, Junior Achievement of Elkhart County/Lemonade Day, George and Kathy Freese and Tom and Dottie Arnold, Ruthmere is pleased to offer field trip assistance for grades K-12 to the first 2,000 students residing in Elkhart County and ANY COUNTY immediately adjacent to Elkhart County in Indiana or Michigan. The sponsorship pays for the tour experience for students, accompanying teachers and one adult chaperone for every 8 students. Additional adult chaperones are admitted at the group tour rate of $7 for Ruthmere tour, $3 for Havilah Beardsley House tour or $10 for full campus tour. All Elkhart County school tours grades 3-Senior (public, private and registered home schools) include a student membership valued at $25 per year, that goes to every participating student. These student memberships are valid from the day of the student's field trip until the student's high school graduation. We have developed a set of materials for teachers to use in the classroom as part of their local history curriculum. 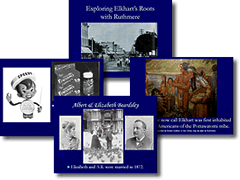 The PowerPoint presentation "Exploring Elkhart's Roots with Ruthmere" is also ideal as a preview presentation for classes planning a visit to Ruthmere. The complete kit includes the presentation, a presenters guide and a copy of the Indiana State Standards for third grade social studies to help in lesson planning. Download the complete kit below (this is a 50 mb download, so please allow sufficient time).